There's no point in looking for the next Shalimar among the Aqua Allegorias, but some of them have been highly enjoyable fragrances, and a few of them of them are staples in my summer fragrance wardrobe.2 The last few years, though — since Thierry Wasser took over as Guerlain's house perfumer — they've been concentrating on a "young, fresh and dewy" style, not altogether unlike that of Guerlain Idylle. Sometimes that works, sometimes the output strikes me as forgettable and/or insipid. This year's widely distributed Aqua Allegoria is Lys Soleia, and it's the first one I've really liked since 2008's Laurier Réglisse.3 As you no doubt deduced from the name, Lys Soleia is "about" lily, and the lily is indeed the star of the show from the moment Lys Soleia hits skin. It isn't quite a lily bomb, but it's got more heft than your average Aqua Allegoria, and in the early stages, more heft than some recent lily fragrances like Cartier Baiser Volé or Keiko Mecheri Soussanne.4 Lys Soleia is bright, greenish, and somewhat fresh early on, with citrus and distinct fruity undertones. As it dries down, it stays focused on the lily but adds a medley of creamy tropical flowers, and it takes on more of the spicy edge you'd expect from a lily-based fragrance. In keeping with the Soleia part of the name, there's a subtle nod to the suntan-oil genre, and a whiff of salty, sun-warmed-skin in the musky vanilla base. Lys Soleia, to my nose, joins the "highly enjoyable" class of Aqua Allegorias. It's better done than many of them. I wouldn't say it's necessarily easy to wear, and I would guess that many people are going to find it too heavy for really hot summer days. Still, if you like lily, it is worth the trip to Sephora (or your local equivalent) to try it. If you don't like lily, I doubt it will suit you. My one complaint is my usual complaint, and echoes Kevin's complaint earlier this week about Histoires de Parfums Pétroleum, and that is the white musk used in the base. For most of its development, Lys Soleia smells lovely to me, but on a few (not all) wearings, I found that very near the end, it came dangerously close to lily dryer sheet. Then I was not quite so enchanted. Still, it's going on my buy list, although like many things on my buy list I'll probably never purchase it unless I find it at a substantial discount — my relationship status with Lys Soleia is "deep like", not "undying love" — and given the choice, I'd probably take a bottle of Laurier Réglisse over Lys Soleia. Lys Soleia is arguably the better fragrance, but Laurier Réglisse would probably get more wear. 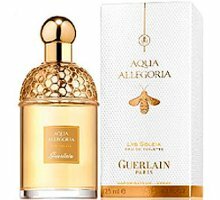 Guerlain Lys Soleia was developed by perfumer Thierry Wasser. The notes include bergamot, lemon, palm leaves, ylang-ylang, lily, tropical fruit, tuberose, vanilla and white musk. It is available in 75 and 125 ml Eau de Toilette. The 75 ml is $61 at Sephora — it's not a bad price per ml, but I don't generally stand at the perfume counter calculating the price per ml, and I doubt many other consumers do either. Given the total price, and the number of (cheaper) small bottles available these days, I'm not sure the Aqua Allegoria line really stands out as "reasonably priced" any more. You can pick up a small bottle of Insolence or Idylle for less. Note: top image is p_0402 [rotated] by tomooka at flickr; some rights reserved. 1. This year, the "not in widespread distribution" Aqua Allegoria is Bouquet de Mai, which can be found in duty free stores. 2. I own Herba Fresca, Anisia Bella and Mandarine Basilic, and Laurier Réglisse has been hanging out on my "to buy" list since it came out. 3. Laurier Réglisse, by the way, did not appear to be widely loved. 4. A couple lily bombs, for anyone who needs one: Donna Karan Gold (discontinued, but still reasonably easy to find) and Serge Lutens Un Lys. 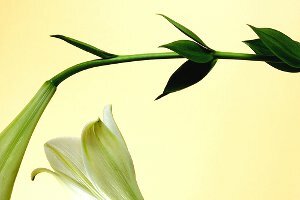 Lighter, fresher lilies include Annick Goutal Des Lys and Hermès Vanille Galante. Hi, Robin. Really interested to read your views on Lys Soleia, and I think I agree with you that it is good but not necessarily outstanding. It lasts a looong time, unlike some of the others, and I think I would wear it more if it didn’t give me a crashing headache! You are right about Donna Karan Gold being a bomb, and I think the Lys is not unlike it, but lighter and greener. I would love to smell the Laurier Reglisse. I also ended up with a MASSIVE HEADACHE after spraying LdS. Initially I liked it though. Ouch! I am lucky, I never get perfume-related headaches. It seems like lily scents often trigger headaches? I have heard many people say they can’t wear DK Gold for that reason. As for me, DK Gold is my Lily Bomb for Life. I love it so. But this one sounds worth trying. Yes, and have heard people say that about Un Lys as well. I was really curious to see what you’d think of it, Robin. I did not enjoy that last couple that I smelled (Nymphea and Jasminora) so, the cynic that I am, my expectations for this were pretty low. I was a pleasantly surprised to be proven wrong and discover that it’s a rather nice lily. Not mind-blowing but nice nonetheless. “Not mind-blowing but nice nonetheless” is just about right. I think the only reason it makes my buy list is that there are so few decent lilies at all. Also gave the new EdT version of Baiser Vole a quick try, and going to try it again — it might be a nice summer option too. That’s definitely one of the reasons why I approve of it, too. Plus, so many mainstream releases are so ubiquitous that something like a nice, realistic lily actually stands out from the crowd. I’ll have to try Baiser Vole EDT. I only tried the original very quickly but I liked it well enough. Seemed greener & sharper & more summery, but need to do a proper test, next to the original. I recently tried AA Herba Fresca which I found nice (mum liked it too), but I prefer my Nuit Etoilee to the Guerlain. Looking forward to try Lys Soleia. Herba Fresca is more summery, to my nose, but they’re both great scents. Robin, your review has persuaded me to sniff this next time I’m at Sephora. I share your general sentiments about the AA line, so it’s promising to hear that there’s a little more there there with this one (so to speak). If it weren’t for the dryer-sheet aspect, I’d be unreservedly enthusiastic — but I was anosmic to whatever musk was in last year’s AA Jasminora, so maybe that’ll be the case again. I was really sorry not to love Jasminora, I do love jasmine. Hope you’ll be able to smell this new one. Emily I didn’t get dryer sheet from this one. Thanks, Lys — hoping to stop by Sephora after work today for a sniff. I’ve tried to at least sniff all of the AA’s, and I must say the only one I wanted to go FB was Flora Nerolia. It’s almost too much in the hot summer months, but I reach for it anyway. I’ll be hunting up a sample of the Lys, my BFF loves all scents lily. Originally touted as a riff on Mahora, it’s too much of a big white floral to my nose. It’s slightly reminiscent of Lys Mediterranee which was also a disappointment to me because it is too strong and has incredible lasting power (not a bad thing). I was hoping for a more marine scent. So both have depth and are good fragrances but just not for me. The white musk in Idylle makes me gag as I’ve discovered that persons with bronchial problems are wont to do. What’s with all the white musk in fragrances lately? People just like clean, these days, I guess. I wish they wouldn’t use it in perfume & just leave it to detergents. Soooo much white musk in everything. People must really love it. My problem with Carnal Flower is the white musk too. It’s so sweet and never ends! Seriously lasts for days. Actually now that I think of it I find CF to be much more of a lily scent than a tuberose (at least in the traditional sense of how perfumery treats tuberose). I think people do love it, and it must help sell fragrance. It doesn’t bother me in CF…and often I don’t notice it in fragrances at all. Just as well. I just bought this at the airport on the way back home from Rhodes. It is sweeter than my usual perfume wardrobe for summer, but it brings back nice sunny summery and sweet memories of that wonderful Greek island, so I wear it happily. this is my first AA so I cannot compare to the rest, but it is really long lasting on me. Trust me, this one lasts far longer than most of them! Nice that it has that happy memory for you. I suspected it for a while, but had it confirmed the other day: I do not like lily scents. Really really really not. So I’ll pass on this one. I have yet to find one AA that I would enjoy wearing, anyway. Indeed. I’m so glad I don’t like *everything*. For me the vanillic base ties this AA to its Guerlain roots, which is so unusual but welcome for an Aqua. But since Baiser Vole smells like dryer sheets on me and I think I remember you like it, it this may be a skin-type issue where my skin agrees with LS’s type of drydown. No, I don’t think it’s in all the HdP fragrances…certainly not in the older ones, at any rate. Yes, I’ve heard that…I don’t really remember Y&A well enough to say, but going on memory, it was sweeter than this, and less summery. Well that’s it. Now I have to try this. It is really worth a try, at least!